An artist’s idea of an operating room, Delineator, Sept. 1934. But it never occurred to me that Butterick would offer sewing patterns for surgical gowns and dentists’ smocks. We now order such things from specialty uniform supply houses. Butterick pattern 5306 is a doctor’s operating gown and cap. From Delineator, June 1924. I hope no doctor operated in his spats…. And — maybe it’s the test tube — but there’s a touch of Gene (Young Frankenstein) Wilder in his eyes. Butterick suggested it was “much less expensive” to make gowns like this than to buy them. During World War I, Red Cross Volunteers made surgical gowns, robes for hospitalized soldiers, specialized pajamas for hospital and convalescent use, hot water bottle covers, bed linens, and surgical dressings, among other things. Patterns for these officially approved hospital supplies were available for ten cents; this article ran in Ladies Home Journal, Delineator, and other women’s magazines in the fall of 1917. These images are from Ladies’ Home Journal, December 1917. LHJ, Dec. 1917. The urgent need for such hospital supplies brings home some of the horror of the war, in spite of government censorship at the time. “Already the needs are greater than the supplies available….” American women wanted to help, but their efforts needed to be directed toward the most urgent medical needs in 1917 and 1918. So the idea of sewing home-made operating gowns was not at all strange in 1924. Butterick 5426, a pattern for a dentist’s gown from Delineator, August 1924. The basic dentist’s gown didn’t change much, except that short sleeves were introduced…. A dentist and his nurse in an ad for citrus fruits. Delineator, June 1934. This looks like a woman’s work uniform top; the 3/4 sleeves suggest the World War I era. The neck is plain, and it’s easy to wash and iron. Do you think she was right? Women’s blouses (called “Waists”) from the Sears catalog, Fall 1917, p. 122. Because so many white vintage blouses from this era have survived, I needed this reminder that many brightly colored blouses were also worn in the nineteen “teens.” Perhaps the lacy white “lingerie blouses” have survived in greater numbers because most of the blouses pictured above were made of silk, which is more likely to shatter with age. Blouse patterns from Butterick’s Delineator magazine, made up in colorful fabrics; June 1917. These delicate white cotton voile or batiste blouses from the World War I era have survived nicely. A sheer vintage blouse, circa 1918. Those deep tucks over the sleeve heads would flatter a woman with narrow shoulders. The gathered back with twill tape ties is characteristic of WW I era blouses. All those pin tucks make a beautiful back. A vintage V-necked blouse on embroidered Swiss cotton. The exposed throat came in around 1912. Sheer cotton vintage “Armistice” blouse circa 1918. Inserted filet lace. Detail of inserted filet lace and fagoting on vintage “Armistice” blouse. Construction details like these would cost a fortune today — but they were mass-produced one hundred years ago. Sheer cotton vintage blouse, circa 1918. Detail of delicate work on a vintage cotton blouse, circa 1918. Those last two blouses, which have a center front insert, are the style are often called “Armistice” blouses after a Folkwear pattern that was very popular. Sears sold many versions of this style. More white voile blouses (“waists”) from the Sears catalog, Spring 1919. This pin tucked voile lingerie “waist” from the Knickerbocker catalog ad cost only 98 cents in 1917. Clusters of pin tucks, insertion lace, embroidery, many buttons and buttonholes…. You wouldn’t think a blouse like this could be manufactured and sold so cheaply. Delineator, Feb. 1917. Fern waists came in two price categories, “Fern,” for $1 and “Fernmore” for $2. “Oh, it’s a Fern!” Text of an ad for Fern brand waists, Delineator, May 1917. “Produced by the largest waist-makers of the world…. S. & L. Krohnberg” of New York. These “Handmade Waists for Less Than $1” could be made (with your own hands) from Ladies’ Home Journal patterns. July 1917. Note the colored collars and trim on the three at right. But why make your own blouses, when these could be bought so cheaply? From an ad for Bellas Hess ready-to-wear blouses, Delineator, Jan. 1917. “Sheer, white, washable voile” with inserted lace. Women could also buy lacy blouses for about $1 from the Sears catalog. Inexpensive blouses from Sears Roebuck & Co. Spring catalog, 1918; priced at 89 to 98 cents each. Those matronly flounces (bottom right) seem to have been popular. Inexpensive blouses from Sears, Fall 1917. Although illustrated in black and white, these less-than-a-dollar blouses were colorful. Fall 1917. Sears blouse (waist) No. 27K2230, from Fall 1917, was white with blue, rose, or heliotrope [violet] trim. Compared to the dollar blouses from Bella Hess and Knickerbocker, Sears offered some “waists” at several times the price. The Sears catalogs for 1919 showed beautiful silk blouses — some costing nearly $9.00. Silk blouses sold through the Sears catalog for Spring 1919. The brown-and-black one near the center cost $8.95. Luxurious blouses from Sears, Spring 1919 catalog, p. 34. This silk blouse, like others in the higher price range, features lovely embroidery on sheer fabric. Colored blouses from Sears, Spring 1919, p. 108. If you couldn’t afford the pink one with horizontal tucks, you could make your own from patterns offered by Ladies’ Home Journal or by Butterick..
Ladies’ Home Journal make-over blouse patterns. July 1918, p. 81. This magazine often suggested patterns that could be made using fabrics from out-of style dresses. The skirt of that old striped dress might be turned into up-to-date blouse #9957. Butterick blouse patterns 8768 and 8879, Delineator, January 1917. I have many other World War I era blouse images to share, but I think that’s enough for today. Delineator, July 1917, top of page 51. Butterick patterns. I’ve been collecting images of women’s blouses from 1917; this particular page shows such a variety of skirts, blouses and hats that it deserves a closer look. Butterick Blouse-Waist 9203, Delineator, July 1917. Left, Butterick Blouse-Waist 9203, Delineator, June 1917. Butterick 9203, as illustrated in August 1917. Butterick skirt 9276 and bag 10625. July 1917. Blouse 9203 could be made with a high-necked insert; the blouse has a sailor collar in back. The posture of 1917 is very high-waisted in back — caused by the shape of the corset. Four “blouse-waists” and one “shirt-waist,” Butterick 9153. July 1917. I’ve spent hours trying to figure out the difference between a blouse, a blouse-waist, and a shirtwaist. I haven’t found any consistency yet. Sometimes a “blouse” is pulled on over the head, and sometimes a “shirt-waist” has a button front, but — not always. More about that on another day. Butterick blouse-waist 9280. Delineator, July 1917. The blouse is trimmed with smocking. That interesting belt/pocket is part of the skirt pattern. Butterick skirt 9281, July 1917. This view shows blouse 9280 in a single breasted version, with an optional high neck and the popular sailor collar in back. Skirt 9281. Shirt-waist 9513 and blouse-waist 9116. Butterick’s Delineator magazine, July 1917. No. 9116 has “the new collarless neck.” The hat at right looks very much like a flower pot. Blouse-waist 9116 with skirt 9290. Women who were not comfortable wearing the relatively new bare necklines could make the blouse with a high collar instead. Both skirts have interesting details. The medieval-influenced belt at right isn’t included. Butterick skirt patterns 9266, left; and 9290, right. This was the era of the “barrel” skirt; wide hips were in style. Shirt-waist 9513 and blouse-waist 9116. Butterick’s Delineator magazine, July 1917. Not related to these patterns — except for its sailor collar — is this vintage embroidered lace waist. This vintage “waist,” which literally ends at the waist, reflects the custom of selling dress patterns as separate waist and skirt patterns. This gave the buyer more style options. Butterick blouse-waist 9289 and a skirt (9286) with a [“paper-bag”] waist that tried to come back into style quite recently. July 1917. Butterick skirt 9286,from 1917. 100 years later, this paper bag waist was back. Another high-necked blouse option, sailor collar, and a back view of the skirt with gathers above its waist. And the “most unusual hat” award goes to…. Summer hat, 1917. She also has “bee-stung” lips, usually associated with the 1920s. After 1912, fashion permitted respectable women to expose their necks in the daytime, but not every woman felt comfortable with the change. Butterick waists [blouses) from August 1917 occasionally included a high-necked one. Delineator, p. 47. A vintage lingerie blouse (or “waist”), probably late 1890’s. That high collar wouldn’t give much relief from the heat in spite of the blouse’s sheer fabric. These waist (blouse) patterns from Ladies’ Home Journal, July 1917, all have open necks. In July, a blouse like this must have been wonderfully cool compared to the fashions of the 1890’s. By 1917, when most blouses had open collars, V-necks, or other necklines that bared the throat and part of the sternum, Butterick patterns often still included an optional high-necked version. That’s my excuse for showing these seven outfits from 1917 in all their colorful glory. These look like dresses, but they are waist and skirt combinations. 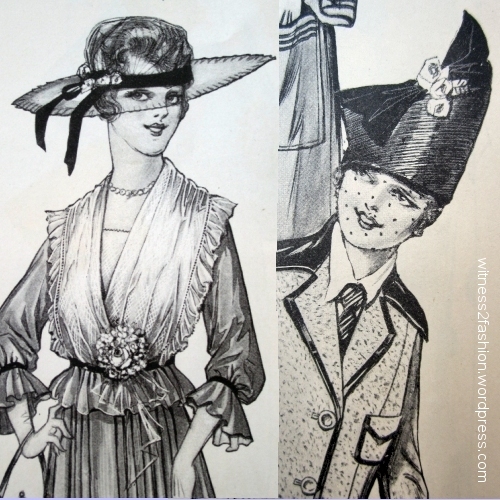 Butterick patterns from February 1917. Delineator. The two at left use chiffon and other sheer fabrics; 8928 has a low draped neckline filled with skin-toned lace. Butterick waist patterns 8927 and 8919. From 1917. In January, Butterick evening waist 8901 was very similar to 8927, but was shown without a blouse under it. Butterick waist 8919 with skirt 8928. Delineator, Feb. 1917. The alternate view shows a high-necked variation without the cowl neckline of the color illustration. Skirt 8928 with “evening bodice” 8956. Delineator, editorial illustration, Feb. 1917. Butterick waist patterns 8927, 8919, and 8923. February 1917. The designs at left and right have contrast collars and a wrapped “surplice” bodice. Butterick waist 8927 with skirt 8949. February 1917, Delineator. This one does not offer a high necked version. It is a “jumper model” in the American sense — a sleeveless garment worn over a blouse. Butterick waist 8923 with skirt 8936. Delineator, February 1917. This blouse waist has a high-necked variation, shown with a dark collar. A “French lining” fit the body closely and supported draped effects. In this period, as in the 19th century, the closure of the lining did not always line up with the closures on the outer garment, which could be very complex. These are dresses, not waist and skirt combinations. Delineator, Feb. 1917 page 52. No. 8942 looks like a coat, but it’s a dress. A closer look at the necklines and the hats. 1917. 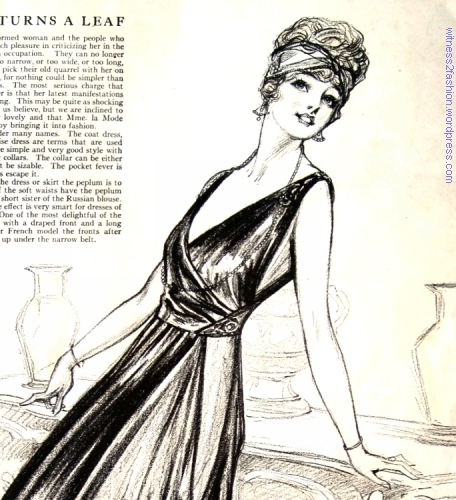 Butterick dress pattern 8942, from 1917. The vest front is “equally well adapted to a high or the open throat.” There are at least three sleeve and cuff variations. This vintage blouse uses hand smocking to control fullness at the shoulders, waist, and sleeves. Probably before 1920’s. I’ve already shared some 1940’s patterns for smocked blouses, but I keep finding more examples of smocking. Butterick smocked blouse pattern 4456, Butterick Fashion News flyer, March 1948. McCall smocked blouse pattern 1136 from 1944. But those forties’ blouses have a peasant influence; they are based on smocked ethnic clothing. An embroidered ethnic blouse with smocked neckline. An ethnic peasant blouse with hand-smocked neckline and wrists. An ethnic flavor was also very popular in the nineteen twenties. Vintage twenties smocked and embroidered peasant influenced dress. This earlier blouse, however, bares little resemblance to “peasant” styles. Vintage smocked blouse made of sheer fabric with woven stripes. The collar covers much of the smocking across the shoulders. So-called “Armistice” blouses are usually short-wasted in back. I flipped the collar up to show the hand smocking on the back of this blouse. It seems a shame to hide all that work! I had forgotten about this vintage blouse — it is probably from the “teens.” It uses the stripes woven into the fabric as the grid for smocking, and uses smocking instead of machine-stitched tucks to control the fullness at shoulders, sleeves, and waist. The sleeves have a smocked area near the wrist, creating a modest frill. Smocking in the wrist area. There is a narrow dark stripe in the fabric next to each tightly woven white stripe. McCall smocking pattern 441, from 1936. Striped fabric can be smocked in ways the either preserve the stripe, as here, or turn them into a “solid” color. Both effects are pictured in the book A-Z of Smocking, reviewed below. Image reproduced for purpose of review example only. Do NOT copy. I found another — to me, unexpected — use of smocking on a black silk apron from an era when most older women were almost perpetually in mourning. A black silk apron with a smocked bib. It’s shown over an unrelated turn-of-the-century blouse. Perhaps this apron was worn for nothing more taxing than a little hand sewing — or pouring tea. Cover of A-Z of Smocking, 2016 edition, by Sue Gardner. I was fascinated by the many smocking patterns I found in 1940’s McCall catalogs, so I wanted to learn more about this old technique for fabric modification. If you want to find beautifully illustrated, step-by-step smocking instructions, this book couldn’t be clearer. If you are a beginner with an interest in the history of smocking, this may not be quite what you are looking for. The text can be this brief because the illustrations are so informative and well organized. Photo from A-Z of Smocking for purpose of review. Do Not Copy. A typical section from A-Z of Smocking will have at least two pages of careful and very clear instructional photos like this for every technique covered. Do Not Copy Image. It even explained (and illustrated the steps to using) a machine that gathers the fabric for you. But the topics I was looking for — about the history of smocking, why it was used for work clothes, which stitches were stretchable and used for the wrist area, for example, were hard to find. This is the entire passage about Traditional Smocking. No illustrations. A-Z of Smocking is not a history book. Do Not Copy This Image. Some of the oldest smocking techniques — sometimes called English smocking from its use on shepherd’s smocks — depend on first gathering the fabric with several rows of identically spaced stitches, and then stabilizing them with the decorative smocking stitches. When I read that, in combination with seeing the many stitching examples, I realized that a smocking grid looks a lot like the grid used for cartridge pleating, which had been used to gather fabric in garments for centuries. Illustration from the section on cartridge pleating in The Costume Technician’s Handbook, by Rosemary Ingham and Liz Covey. Do Not Copy Image. If you’ve examined mid-nineteenth century dresses, or made Renaissance costumes, this technique for gathering fabrics evenly and stitching them to armholes, yokes, or waists will be very familiar. Attaching cartridge pleated fabric — e.g., a skirt — to a waistband. From The Costume Technician’s Handbook. Do Not Copy Image. Cartridge pleats produce tightly controlled gathers in this 19th century fan-fronted dress. Typical cartridge pleated skirt, stitched to bodice binding. Inside of dress showing extra fabric at CF. You can also see that the front opening is boned. For me, this links two very useful books: The Costume Technician’s Handbook, which I cannot recommend frequently enough (the techniques are not limited to costumes,) and the A-Z of Smocking, which I would eagerly buy if I had a practical (rather than academic) interest in smocking. The stylized roses of the 1920’s are lovely, and putting just one on a simple dress can really make it look authentic. A wedding dress with a single, large beaded rose at the hip. Butterick 6224 from October 1925. Delineator. It would be equally attractive (and authentic) in black or gold beads on black satin, or white beads on pink, silver beads on pale blue, etc. The Robe de Style from 1926 has two spiraling beaded flowers on the skirt, and a band of beading on the cape-like collar. Butterick embroidery transfer 10472, on dress pattern 7047. However, here is the beading pattern that was used. It appeared in Delineator in May of 1925. It is Butterick embroidery design 10340. Butterick beading transfer 10340 offered the stylized rose in several variations — a single rose, a rose with tendrils, and the large repeating pattern used on wedding dress pattern No. 6227. Butterick transfer 10340, May 1925. Work it in beads or in French knots. You can actually count the beads. Putting a rose like the one in the center on the ends of a chiffon sash or the neckline of a dress would not really take very long. For that matter, you could do it in rhinestones on a T-shirt or in studs on the back of a leather jacket! A photograph of one beaded rose. Delineator. A larger rose would take more beads or bigger beads. In a smaller scale — or with bigger beads — this rose could also decorate the side of a cloche hat. You can play with designs, like this…. Top, the pattern turned sideways; bottom, used as a applique with two sets of tendrils. … Moving or combining them, enlarging them as needed. Sometimes an applique was beaded. Embroidery transfer 10378, Delineator, October 1925. Bridal dresses, April 1925. Butterick patterns 5719 and 5447. You could work these embroidery patterns in beads or shiny silk embroidery floss on dresses, or in cotton on pillowcases, although French knots do make quite an impression on your cheek! This late teens or early twenties blouse is trimmed with shiny silk floss embroidery, appliques of orange fabric, and beading plus embroidery on top of the appliques. Rows of French knots in apricot and ice blue silk look like beading, but they are not. They’re knots :). The yoke and hip band on this vintage blouse were trimmed with pale, translucent beads for a subtle effect. Lace was applied to the satin and enhanced with matching gold-bronze beads. Lots of impact, but very little hand beading. In spite of the blurred photo, you can appreciate the opaque white and pink beading on this peachy pink vintage dress. The pieces were probably professionally beaded before being assembled into a dress. Recently Lynn at American Age Fashion posted photos of some older women wearing sheer day dresses in the 1930‘s and the 1940‘s. Ashville, Ohio, July 4th 1938. Photo by Ben Shahn, Library of Congress. Like Jennifer (from Holliepoint) in Lynn’s comments section, I was surprised that older women would wear sheer dresses that showed their slips. In the fifties and sixties, just having a slip strap drop off my shoulder and become visible was a mortifying experience for me. “Intimate apparel” was not supposed to be seen except in intimate situations. However, I was forgetting that many fashions of the 1900’s and 1910’s were sheer, and that women who had been twenty or thirty at the turn of the century would not think of summer dresses that revealed your lingerie as shockingly new. Au contraire. 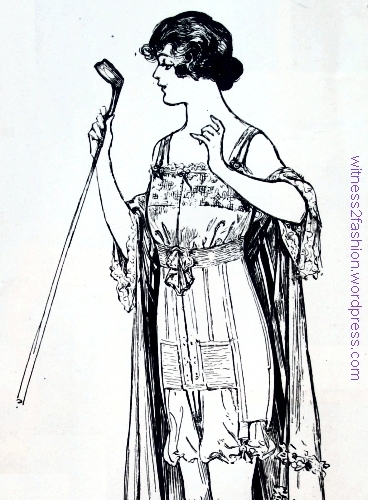 Ladies’ blouse/waists, Delineator, July 1917. Most of these are sheer; you can see through the sleeves, and probably through the bodices, in real life. Early in the century, there was even a long-running fashion for “lingerie dresses” like these; they are made of sheer “handkerchief linen,” or cotton batiste, or lawn and ornamented with inset lace, like the underwear (lingerie) of their day. Lingerie dresses. Left, early 1900’s; right, 1910’s or early twenties. These were photographed over a black slip to show the lace to advantage. A white slip would have been very visible through these dresses. Thin cotton fabrics and lace inserts were used to make undergarments and also to make blouses. Butterick patterns from Delineator, 1917. The blouse/waist at right is sheer enough to show the model’s embroidered underwear, or a lace underbodice. A blouse/waist so sheer that it is made of two layers of netting. Private collection. This sheer, embroidered netting blouse has a “sailor collar” in back. Circa 1910’s to 1920’s. Sheer blouses like the one below are now called “Armistice Blouses,” but it probably dates earlier than 1918, when the Armistice ending World War I was proclaimed. In this photo, you can easily see the coat hanger through the blouse. Underwear would have been equally visible. Skin and underwear would have been visible through this sheer cotton vintage blouse. Private collection. Purple chiffon waist, probably 1910’s. Sheer, embroidered pink blouse or waist. Probably 1910’s. It makes sense to me that women who wore these sheer clothes in their prime . . .
Sheer vintage blouse, before 1910. Older woman wearing a sheer, striped dress. Fourth of July, 1938, Ashville, Ohio. Library of Congress photo by Ben Shahn. Detail. A dress flattering to larger figures, Simplicity 3139, store flyer, Oct. 1939. Sizes 32 to 44. DuBarry pattern 2319B, for a sheer afternoon dress. Store flyer, Aug. 1939. Available in sizes 32 to 42. Vogue 8315, Vogue store flyer for May 1, 1939. Sizes 32 to 42 bust. Companion-Butterick pattern 7989, from August 1938. Dotted sheer fabric. Simplicity 3205, store flyer, Oct. 1939. A dress with sheer lace yoke and sleeves. Fourth of July, 1938, Ashville, Ohio. Photo by Ben Shahn from Library of Congress. Detail. A sheer dress with polka dots and a lace dress. “Figures are no problem to us.” A lace evening dress with bolero jacket, Butterick Fashion News flyer, August 1938. Lace dress for larger or mature women. Butterick pattern 7998, 1938. “Wear with dignity and chic.” Sizes 34 to 52 inch bust. For more about these and other sheer nineteen thirties dresses, click here. Thanks again to Lynn at American Age Fashion for writing about photos of older women in sheer dresses!